Network Analysis is the process of creating a data model of transfer and/or impedance characteristics of a linear network through sine wave testing over the frequency range of interest. Creating a data model is important in that actual circuit performance often varies considerably from the performance predicted by calculations. This occurs because the perfect circuit element doesn't exist and because some of the electrical characteristics of a circuit may vary with frequency. At frequencies above 1MHz lumped elements actually become 'circuits' consisting of the basic elements plus parasitics like stray capacitance, lead inductance, and unknown absorptive losses. Since parasitics depend on the individual device and its construction they are almost impossible to predict. Above 1GHz component geometries are comparable to a signal wavelength, intensifying the variance in circuit behaviour due to device construction. Further, lumped-element circuit theory is useless at these frequencies and distributed-element (or transmission line) parameters are required to completely characterise a circuit. Data models of both transfer and impedance functions must be obtained to completely describe the linear behaviour of a circuit under test. At lower frequencies, h, y and z-parameters are examples of transfer and/or impedance functions used in network description. At higher frequencies, s-parameters are used to characterise input-output impedances and transfer functions. Therefore a network analyser must measure some form of a circuit's transfer and impedance functions to achieve its objective of complete network characterisation. Network analysis is limited to the definition of linear networks. Since linearity constrains networks stimulated by a sine wave to produce a sine wave output, sine wave testing is an ideal method for characterising magnitude and phase response as a function of frequency. In non-linear measurements phase is often meaningless and amplitude has to be defined with respect to individual frequency components. For non-linear measurements see information on spectrum analysers and wave analysers. HP 8405A Vector Voltmeter. Voltage & Phase measurement 1MHz to 1GHz with 2 probes. HP 8407A Network Analyser. Mainframe with 2 input tracking receiver, reference and test channels, 10MHz to 110MHz. HP 8408B Automatic Network Analyser 500MHz to 18GHz. HP 8409A Semi-Automatic Network Analyser 110MHz to 18GHz. HP 8410C Network Analyser. Mainframe, 110MHz to 18GHz. HP 8410S Network Analyser Systems Options 100, 200 & 300. HP 8411A Harmonic Frequency Converter. For HP 8410C, reference and test channels, 110MHz to 12.4GHz or with Option 018 to 18GHz, APC-7 connectors. HP 8412B Phase - Magnitude Display. Plug-in for HP 8407A or 8410C. HP 8413A Phase - Gain Indicator. Plug-in for HP 8407A or 8410C. HP 8414A Polar Display. Plug-in for HP 8407A or 8410C. HP 8418A Auxiliary Display Holder. Mainframe to take additional 8412B or 8413A or 8414A plug-in. 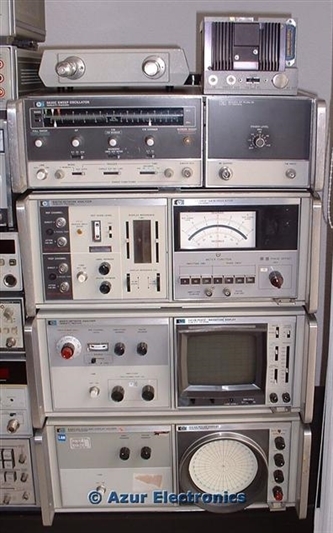 HP 8745A S-Parameter Test Set. HP 11604A Universal Extension. Accessory for HP 8745A. HP 8743A Reflection-Transmission Test Unit. HP 11605A Flexible Arm. Accessory for HP 8743A. HP 8717A Transistor Bias Supply. HP 11600A & 11602A Transistor Fixtures. HP 11601A & 11603A Calibration Sets. HP 778D & 779D Directional Couplers. HP 8761A SPDT RF Switch. For Amphenol 'Blue' Plug & Socket. Used between 8407A, 8410C & 8418A Mainframes to plug-in 8412B, 8413A & 8414A Display Units. After acquiring, repairing and testing the equipment, these are my working notes on operating these network analysers.